Skydiving When Sick – Don’t Do It! When you do something really different for the very first time–skydiving, for example–it’s almost impossible to know if something seemingly small is going to be a big problem. What’s going to make a difference, and what won’t? You have to ask questions in order to form the best plan. Jumping with a head cold, for instance, might seem like a totally doable thing. After all, you’ve likely been waiting to skydive for a long time, and you’re unwilling to let something as petty as a sniffle get in your way. You’re probably pretty sure it won’t make that much of a difference anyhow. Actually–that head cold is a big problem when you’re making a tandem skydive. (We’re as sorry as you are about that little fact.) A head cold should keep you on the ground until it’s completely healed. Here’s why. 1. Skydiving with a cold can actually pop your eardrums. That terrifying little eventuality should be enough to keep you in a holding pattern until you’re hanky-free, for sure. Popped eardrums are super uncommon on land, so most people don’t think about the risk. How does such a thing happen? Two words: pressure differential. When the pressure on the inside of a person’s eardrum is considerably greater than the pressure on the outside–like it is when someone with a stuffy nose goes from thick low-altitude air to thinner high-altitude air–the delicate skin of the eardrum can pop like a bubble. From what we’ve heard, It sounds just like a popping balloon to the sufferer, and it feels like an itsy, bitsy stab wound in a tender, tender spot. You should also be aware that a healthy person’s eardrums don’t pop, ever. This kind of thing only occurs when someone is seriously congested. If you know you’re at risk, however, don’t think twice about it. Reschedule your jump. 2. Pressure headaches are OMG THE WORST. When you add illness and altitude together, it’s not just eardrums you need to worry about–it’s headaches. Similarly to the eardrum problem, these vise-grip-style ouchies are triggered by the difference in pressure between the world outside your stuffed-up head and the world inside your stuffed-up head. When you’re healthy, pressure differences are regulated very smoothly by the body. However, a head cold stoppers up the vents, disallowing the natural failsafes. In this situation, your body does its level best to move the blockages, pumping blood and rearranging swollen tissues–causing a rip-roaring headache in the process–but it just can’t manage until your inflamed tissues calm down. Over-the-counter pain meds have nothing against an altitude headache. Unfortunately, if you manage to get one, you just have to wait for it to be over. It’s an awful wait. 3. It’ll be embarrassing and gross. 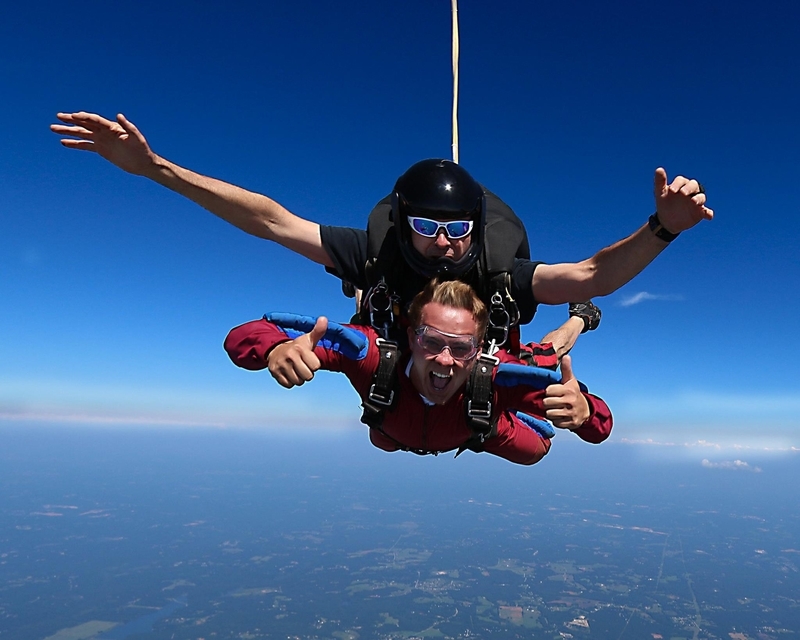 This is the kicker–while the popped eardrum and the headache are likely if you skydive with a head cold, the gross factor is a sure thing. Ask any tandem instructor ever, and they’ll tell you: if you jump with a cold, everybody on the jump is going to land coated in mucus. For this reason, your tandem instructor would like to respectfully beg you not to jump while you’re sick. Here’s how you can expect a sick-day jump to go down: As you’re on your way from high altitude to low altitude in freefall, the thin air will thicken back up to what you’re used to. Your stuffed-up nose will notice the change and rush to get back to equilibrium. How? By running. A stuffy nose basically tries to do the ol’ bucket-brigade trick, rapidly emptying itself out all over the two of you. And, of course, there will be no handkerchief. Too much information? Well: we’re the kind of folks that tell it like it is. We want you to be informed through the entire process and your questions thoroughly, honestly answered! If you have any more, please don’t hesitate to reach out.